You may be wondering why I am wishing a Happy New Year to the trees in February. Today is Tu B’Shevat which is the New Year the trees and could be compared to Arbor Day. In Israel, the almond trees are starting to bloom, so it makes more sense than here with the snow still on the ground. Although Tu B’Shevat is a minor holiday, it is the time of year that we celebrate trees and all that they do for us. Customs for the holiday including planting a tree and eating dried fruits and nuts. 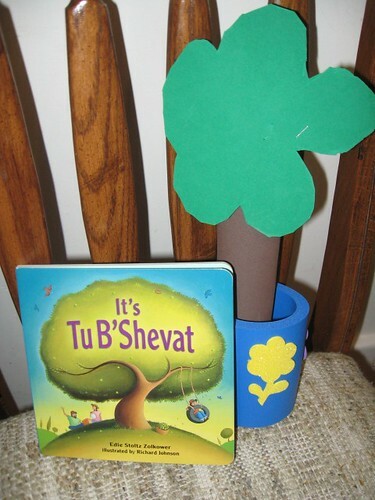 Last week at Hebrew School, NHL made a decoration for Tu B’Shevat. Yesterday, the entire school had a party which included special cake that had dates in it. NHL said it was a lot of fun and then they practiced their Israeli dances for their upcoming festival. JSL also received a book in the mail as part of the PJ Library about the holiday. The book is a great introduction to children about this special holiday and why we celebrate. As you can see, Hebrew School has been a great way for NHL to learn more about our Jewish customs. He has a great time and is starting to learn the Hebrew alphabet. To my surprise he already knows how to write his name in Hebrew. We are well on our way to preparing for his Bar Mitzvah in about seven years. . . OY! I love the idea of having a holiday and customs for celebrating trees!